The steering column transmits the movement of the steering wheel to the steering gear. It consists of two different shafts, which are joined together by a universal joint. The length compensation enables the transmission of the steering movement to the pitman arm/drop arm and to the tilting movement of the cabin, which improves driving comfort and makes maintenance work easier. Connection of the individual parts is effected by ball joints. These are either integrated in the steering rod or are bolted to it and secured by a clamp. Precise adjustment of the steering geometry is thus possible, which reduces tyre abrasion and ensures safety. 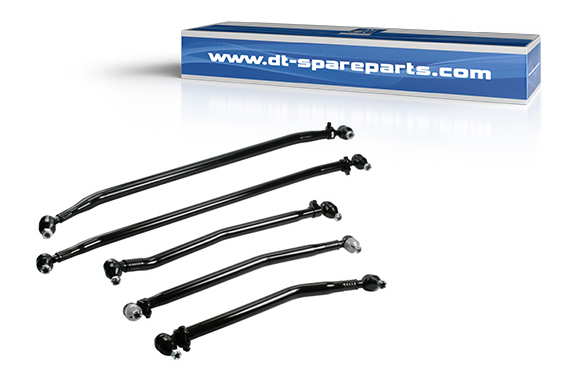 All DT® Spare Parts steering rods are made from high-quality steel. A hardness test on all parts is carried out “in house”. Proper crimping of the integrated ball joints enables a firm grip and a high degree of safety. The dimensions of all parts correspond to the manufacturers’ specification, thus ensuring an optimal fit. The adjustable ball joint is fixed to the steering rod by a clamp. The best possible grip and secure sit of the ball joint is ensured by a slotted bushing opening. The ball joints, in particular their length and conical dimensions fulfil the highest technical requirements. The PTFE sleeve provided is UV, weather and grease resistant, which ensures a long service life of the entire ball joint. It prevents the penetration of dirt and grease into the ball bearing. Additionally included in the scope of supply are castle nuts, pins and protection caps.